1. Polo Ralph Lauren - Lounge Pants. My boyfriend got these for Christmas a few years ago and I may or may not have accidentally stolen them and kept them for myself... These are SO comfy - the perfect pair of PJ pants or lounge pants for your dad to lounge in. These come in several different colors! 2. S'well - Insulated Steel Water Bottle. These water bottles are the best and come in so many different colors and prints. This wooden print one is stylish and masculine enough for a guy. These also come in 3 different sizes - I have the medium sized one that is perfect for carrying around in my purse but a large one would be great to keep at your desk at work. Also, these water bottles keep your beverage cool for 24hours or a hot beverage hot for 12 hours. Hint!! Buy it through the link I attached instead of at Nordstrom - the website I linked gives you 15% off your first order. 3. Mystery Tackle Box Subscription. This is an awesome gift to give a dad who loves fishing! This is a monthly subscription box (either 3 months, 6 months, or 1 year) and will introduce him to new products, teach him new fishing techniques, and help him become a better angler. The box will come with quality lures, jigs, spinner baits and terminal tackle, top-rated soft plastics, free fishing magazine & contests, and exclusive decals and stickers. Get $10 off with code 'DADSFISH'! 3. Patagonia - 3/4 Zip Sweater. You just can't go wrong with a Patagonia sweater as a gift for any guy in your life. They are such good quality and will last years. I like that this grey one isn't some obnoxious print or crazy color - it's perfect for every day wear. 5. Brookstone - The Perfect Drink 2.0. This is such a cool gift to get your dad if he loves gadgets and cocktails. I got it for my dad for his birthday and he loves it! The scale sync's up with an app on your phone and shows you tons of drink recipe's and tells you the perfect amount to pour and even adjusts when you pour too much. It's so cool! 6. Burberry - Checked Silver-Tone Cufflinks. These are 30% off - under $140!!! A perfect gift for the working dad or a dad who simply likes to dress sharp. These are a little bit of a splurge but I'm sure your old man is worth it ;) Burberry is timeless and would make for a great and really special gift. 7. Tommy Bahama - Leather 'L' Fold Wallet. I usually find any kind of men's accessories to be boring and boring to shop for but I have to admit this wallet is pretty cool. I love the vintage map design on the flip out part! Also, I feel like all dads love Tommy Bahama so you can't go wrong there. 8. The Original Whiskey Ball 'Bloxx'. This is a pretty cool gift for those whiskey drinking dads! I think my mom got this for my dad last year for Father's Day and it was a hit! This silicone ice tray makes bigger ice cube in a block shape to not only look better in the glass but also melt more slowly, keeping your drink stronger for longer! 9. Bose - SoundLink Color Bluetooth Speaker. Another great gift for those dads who love their gadgets! I've found that a good speakers is definitely a necessity to have in a house. Bose is arguably the best brand there is. This speaker is small enough to transport everywhere but still gives off a great and loud sound. 10. Picnic Time - Fiero BBQ Tool Set. Dads and their grills, am I right? This slick stainless steel set of tools (includes a spatula, barbecue fork, tongs, and silicone basting brush) is perfect for the grill master of the household. ALSO - the spatula has grooves in the middle of the flipper part (there's gotta be a technical term for this) that works as a bottle opener. Say no more. 11. Ted Baker London - Voyager's Lifestyle Travel Wallet. 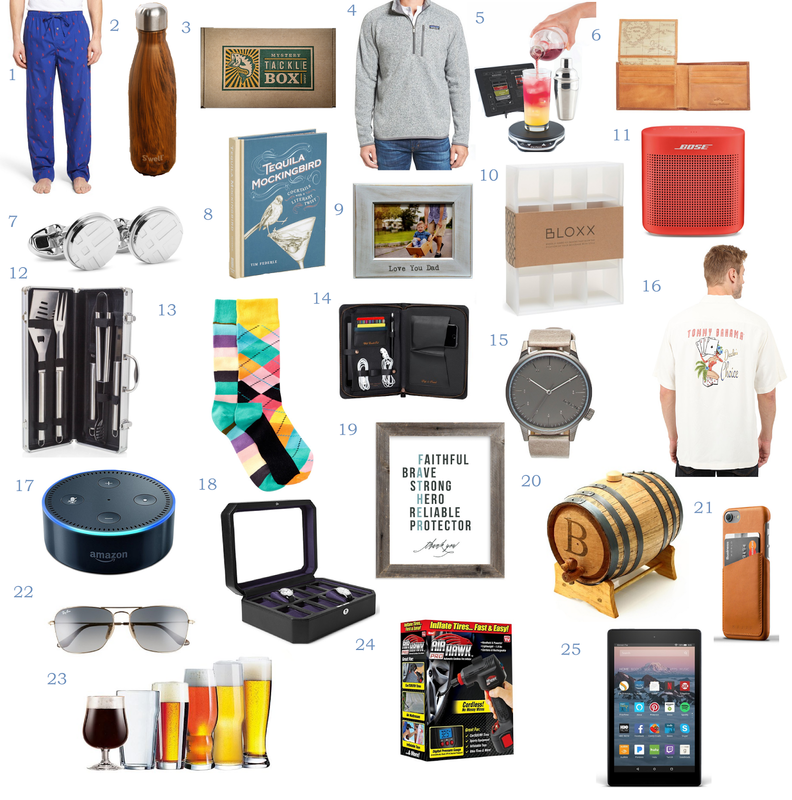 I think this may be my favorite item on the list - such a cool gift idea for the traveling/working dad! This zip around travel wallet has compartments for cash, cards, pens, your phone, and even spots to keep your headphones and charging accessories. 12. Cathy's Concepts - Monogram Whiskey Barrel. I posted several Cathy's Concepts items during my Mother's Day gift idea post as well so obviously have to do the same for Father's Day! This brand is great because they have awesome gift pieces for men as well. A little whiskey barrel is such a cool and authentic piece to add to your home bar area. Monogram this piece with your last name initial or leave the monogram off! 13. Happy Socks - Set of 2 Cotton Crew Socks. A fun set of socks is an easy gift to get your dad. This set comes with 2 pairs and is only $12!! 14. BP Industries - Love You Dad frame. I always think framed pictures are such a great and sentimental gift to give your parents. This is a cute frame to pop in your favorite picture of you and your dad! 15. Tommy Bahama - Dealer's Choice Shirt. This is the perfect 'dad shirt' for summer. This shirt is normally $138 and I found it on sale for over 50% off - just $62.99! There's only a few sizes left (in both black and white) so get it quick. 16. WOLF - Windsor Leather 10-piece Watch Box. This gift is also a little bit of a splurge but a really great gift for dad's who love their watches. This box is great for traveling or even just a decorative piece to display his watches. This watch box can hold up to 10 timepieces and has a cushioned silk lined interior. 17. Our Father's Character Wall Print. This endearing wall print sums up a dad perfect. You can customize the color of the letters as well as the frame! This would be perfect to hang up in in your dads office. 18. Komono - Winston Regal Watch. This watch is 40% off and under than $60!!! This is a very nice looking watch for such a low price. I love a black face on a watch, I think it makes the piece look so sharp and definitely compliments the grained leather strap. 19. Amazon Echo Dot 2nd Generation. I couldn't believe the Amazon Echo Dot was only $50! This is a perfect alternative if you don't want to splurge $180 on the Amazon Echo. This Dot still has so many cool capabilities such as controlling lights, fans, switches, thermostats, garage doors, locks, and more! The Dot also has a speaker to play music and also has the 'Alexa Voice Service' that will play music, provide information, news, sports scores and more. Definitely a cool gadget! 20. Tequila Mockingbird book. A cocktail book with a literary twist - a perfect gift idea for a dad who loves classic books as well as classic cocktails. 21. Luminarc 6 pc. Craft Brew Glass Set. For the beer lovers and connoisseurs, this 6 piece set of glasses is not only a great addition to a bar area but specifically maximizes flavor of certain beers. This is under $30!! 22. Mujjo - Leather Wallet Case. This is a very cool and useful gift for dad's with an iPhone 7 or iPhone 7 Plus. This comes in tan, black, or grey! Eliminate the need to carry around a bulky wallet everywhere with this multi-functional case. HERE's a similar case for an iPhone 6. 23. Ray-Ban Caravan 58mm Sunglasses.. Keep your dad stylin' this summer with some cool new Ray-Ban's. This one is also a little bit of a splurge but he is worth it! 24. Amazon Fire HD 8 (with Alexa). If you don't want to spend big bucks on an iPad or if maybe your family isn't into Apple products then the Amazon Fire HD 8 is a perfect gift idea. A 32 gb size is under $110 which is a tiny fraction of the cost an iPad would be. 25. Air Hawk Pro Powered Multi Tools. This is a really cool gadget I found while browsing for Father's Day gifts that I feel like all dad's would like to have. The Air Hawk Pro is an automatic cordless tire inflator. It's lightweight, handheld, powerful, cordless and rechargeable. Perfect for inflating car tires, bike tires, inflatable mattresses, sports equipment, and more! What are some ways you're celebrating your Dad for Father's Day? sunglasses are such a good idea!!! These are all great ideas, not just for fathers day, but birthdays as well! You definitely have some great gift ideas! I need all the ideas I can get because my dad is so picky haha! Great picks and thanks for the inspiration! Great ideas babe. Thanks for sharing! So many great gift ideas! This year will be my husband's first fathers day and I am kind of stumped on what to get. This is very helpful. Thanks! These are very cool stuff! I might buy a shirt for my dad actually! I have yet to get a gift, but I think a watch would make a great gift for my dad! So many great picks! 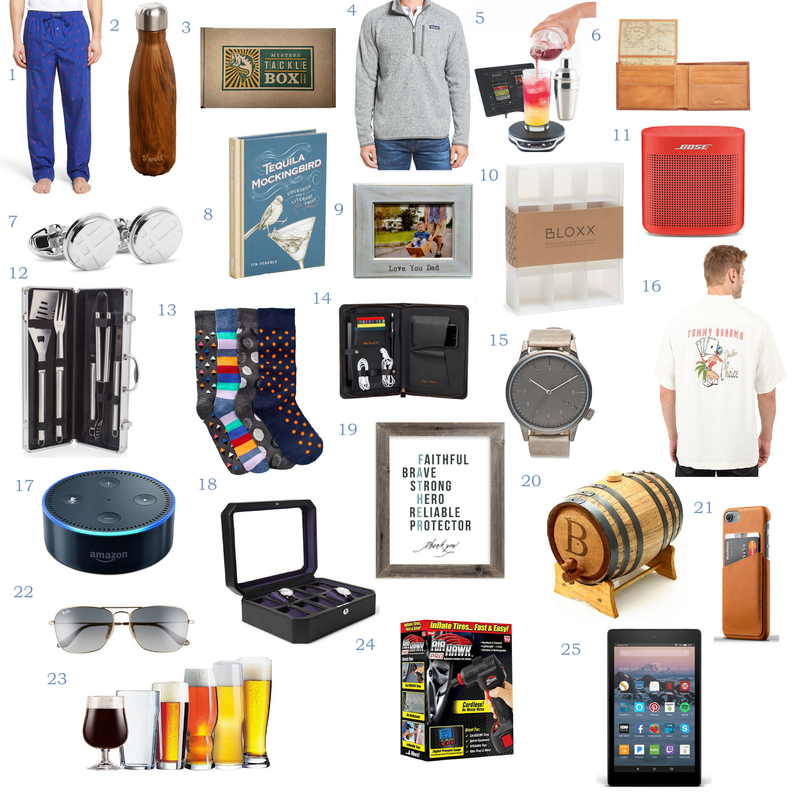 Dads can be tough to shop for - love this round up! I love that you listed so many options - plenty to choose from for all types of dads! Nice picks, thanks for sharing.